The first of the month just keeps coming and We Should Cocoa turns forever faster! October has been a busy month what with National Chocolate Week, Halloween and the last few episodes of The Great British Bake Off – oh no! There are a lot of us bakers who are very sad to see it go. But read on to see what these 13 cheeky chocolate recipes have been inspired by. Decadent fudgy chocolate and pistachio slice from Suelle at Mainly Baking made with condensed milk and a biscuit base. Chocolate chunk cookie dough traybake from Caroline Makes – now those are what I call chocolate chunks. After such sweet treats, this white chocolate & lime cake from Jo at Seven Green Apples makes a welcome appearance. I was particularly excited to see that kefir had been used in the mix – I’m not the only one then! Tiffin is one of my favourite things and I’d love a piece of this toffee apple candy chocolate tiffin from Beth at Jam & Clotted Cream as my Bonfire Night treat. Halloween had to make an appearance and I’m so glad it did. This chocolate peanut butter swirl cake from Elizabeth’s Kitchen Diary is the best Halloween Cake I’ve ever seen. If you fancy viewing some stunning French sunsets and finding out what this Crème au Chocolat has to do with Proust, then head over to Phil’s blog As Strong As Soup. These sumptuous fruit and nut chocolate shards with popping candy from Galina at Chez Maximka were a fitting tribute to National Chocolate Week. One of two chocolate birthday bundts for Miss GF by Kate at Gluten Free Alchemist. And yes we have a #GBBO inspired bake – Snowy Black Forest Roulade from Sammie at Feasting is Fun. My nod to National Chocolate Week were these triple chocolate buns and very nice they were too. We are assured by Johanna that her post is not a Halloween one, but these balls look like mighty fine one eyed monsters to me. However, unlike most Halloween treats, the chocolate tahini maca bliss balls from Green Gourmet Giraffe are healthy ones. Oh there are so many yummy things here. We don’t have tiffin here in NZ that I’m aware of, or maybe we call it by a different name but whatever it’s called, I’ll be trying both these. Tiffin is also called fridge cake and biscuit cake. You can tell I like it as I have about 10 different recipes on my blog. Tiffin, kefir and Proust! Oh my! A great fun round up and too much temptation. I have a few chocolate posts this month and am just not sure which one to send in! After your comment on the tahini and chocolate combination I am tempted by my chocolate and tahini recipe but might go for the fun cake! Oh decisions, decisions! I’m impressed you’re so well organised you know what you’re going to make. What a delicious collection! I’m torn between the tiffin and that chocolate Halloween cake! It’s a good one isn’t it? For me, I’m just unable to resist tiffin if it’s on offer. What a wonderful array of delicious recipes all look so tasty. It’s hard to go wrong with chocolate, but I always enjoy seeing what people make with it. Ooh what a yummy We Should Cocoa collection. Thank you for featuring my gluten free Roulade. I’ve also been checking out some of the other bakes and bloggers. A lovely way to view more delicious recipes. Very fine roundup and a great variety of very fine recipes. I’m sorry to have stayed away for so long. Yes, you are very much missed Phil. Hope to see you joining in more often again. What a delicious round up Choclette. I can’t believe it’s so long since I baked with chocolate, must remedy this and make sure I join We Should Cocoa more often. I always love seeing what people have made, but you are right that spider cake is ace. 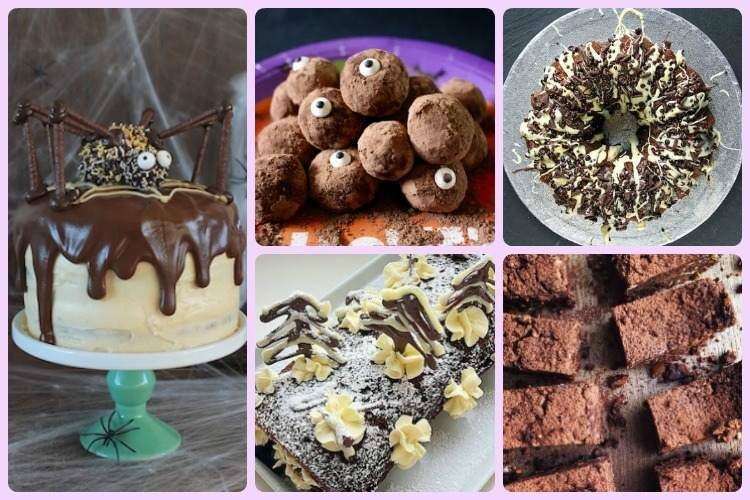 Loving all these chocolate bakes, loads of chocolate inspiration here! I’ve added a little something this month, hurrah!